DiskPulse Server may be controlled using a full-scale client GUI application or a command line utility locally or through the network. 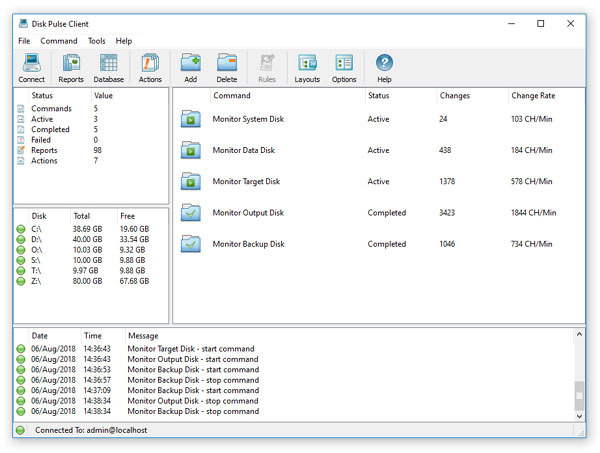 The DiskPulse client GUI application is very similar to the desktop product version, but provides the ability to configure multiple, parallel disk change monitoring operations and adds advanced statistics and history trend analysis capabilities. DiskPulse Server is especially designed to run on production servers using a very small amount of system memory and CPU resources in order to minimize the potential impact on running applications. 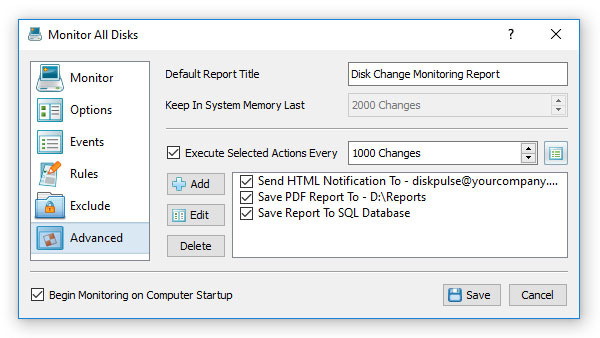 For mission-critical servers, DiskPulse provides the ability to completely offload disk change monitoring reports management and analysis to a centralized DiskPulse database server, which can receive reports from multiple production servers, analyze detected changes using user-specified rules and policies, send notifications and/or save reports when critical changes are detected.